After a successful outing at the 2018 Dakar Rally with a racing machine inspired by the SsangYong Tivoli, the South Korean carmaker has revealed the new Rexton DKR for next year’s edition of the world’s toughest rally. 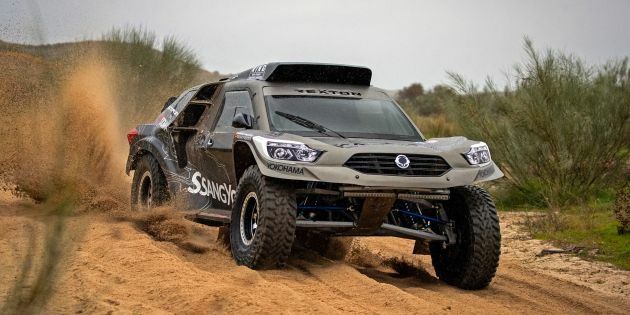 The work of SsangYong Motorsport in Spain, the Rexton DKR features a dune buggy body style with some of design features found on the Rexton SUV. These include things like the hexagonal grille, large headlamps and brand logo cut into the chassis. Beyond that, everything about the rally car is bespoke to ensure it is strong, fast and light to compete in the T1-3 class (two-wheel drive petrol vehicles). It is rear-wheel drive and is powered by a V8 race engine that makes 450 hp. While it weight less than 1,900 kg, the Rexton DKR will hit 195 km/h and do the century sprint in 4.4 seconds. To ensure a balanced weight distribution, the V8 is rear mid-mounted between the two axles. The mill also comes with a MoTeC programmable switch to allow for on-the-fly engine mapping changes, and is fuelled by Lightweight Pyrotect fuel tanks. A six-speed Sadev SL90-23 sequential manual gearbox is tasked with transferring the engine power to the road, aided by a tri-disc ceramic clutch rated at up to 1,500 Nm of torque, as well as a Torsen self-locking differential unit. The body itself is fitted to a tubular chassis made from chrome-molybdenum and TIG welded for good torsional stiffness. Mounted to the chassis are double arm suspension with King shock absorbers and helical extension springs. High-performance AP brakes provide good heat dissipation and resistance to fade, while Raceline alloy wheels are paired with Yokohama Geolander tyres. 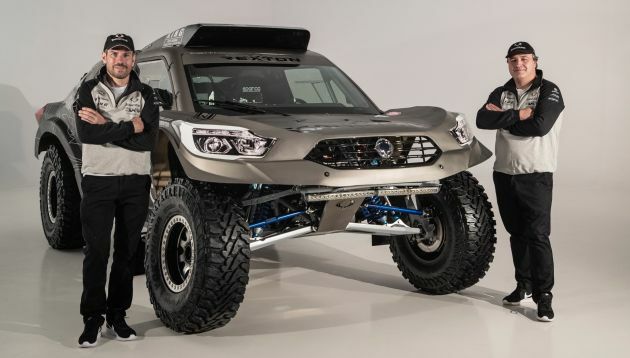 The Rexton DKR will be driven by Spanish driver Óscar Fuertes with Diego Vallejo as co-driver, the same team that competed successfully in last year’s Dakar Rally the Tivoli-based car. With less than half of the cars completing the 2018 event, they were the second rookie team to make it to the finishing line and 32nd overall.